Transforming your everyday, run-of-the-mill bathroom into the elegant space that can become your favorite room in the house starts with a vision. At Magazi Kitchens & Baths, we’ve spent more than 25 years turning our clients’ visions into real, working bath spaces that meet their every need. We’re consistently chosen as a top custom bath designer because of our ability to transform spaces into customized designs that are uniquely suited to our clients. A popular design that many of our clients request is the bathroom spa. Perhaps an elegant soaking tub is what you desire as the centerpiece of your new spa-like retreat. If so, you’ll need to consider whether you want whirlpool features or not. Whirlpool tubs can offer luxurious massage treatment for aching muscles. State of the art technology such as music in tubs and showers and TV’s in medicine cabinets can create a relaxing atmosphere. For a master bath suite, you may prefer a shower over a tub. This doesn’t mean you can have just as much luxury and advanced technology to make the space truly a bathroom spa. 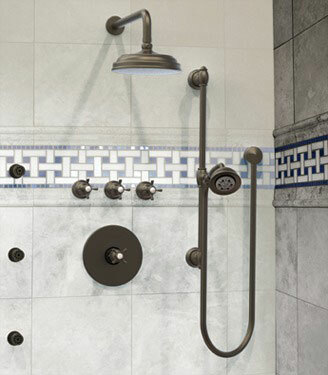 Newer shower systems feature electronic controls that let you set steam, water sprays, and a host of other features. It all depends upon what you want. You have many options for bathroom flooring, and the bathroom designers at Magazi Kitchens & Baths excel at helping you make smart decisions. Porcelain or ceramic tile is a top option for flooring, as it offers design alternatives such as stone or wood appearance and can be cost-effective. Vinyl is another top option that is highly water resistant, making it ideal for children’s bathrooms. Natural stone such as honed marble or granite is a highly-luxurious choice that creates a look and feel like no other. 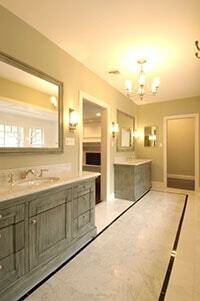 There are countless other considerations that go into your custom bathroom design. The team at Magazi-AG has been working as bathroom designers for over 25 years, helping homeowners choose designs that are as visually appealing as they are practical to use. 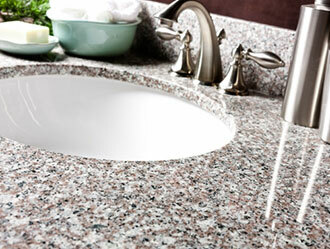 We can help you choose everything from faucets and sinks to lighting that will accent your new space. Countertops and cabinetry are essential elements in the design of your space that can create any look from traditional to transitional to contemporary. Magazi Kitchens & Baths has worked as a bath designer throughout Montgomery, Howard, Baltimore, and Anne Arundel Counties, including the towns of Bethesda, Silver Spring, Rockville, Chevy Chase, Gaithersburg, Olney, Ellicott City, Columbia, and more. Start your bath design today with a free consultation in your home or at our showroom. We listen to your expectations and endeavor to exceed them. Call us at 301-913-0286 or contact us today to get started.